^ Ward, Brian. Recording the Dream. History Today. April 1998. 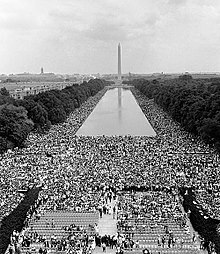 Yet by the end of the year the company was promoting its Great March to Washington album, featuring `I Have A Dream' in its entirety. ^ King III, Martin Luther. Still striving for MLK's dream in the 21st century. Washington Post. August 25, 2010. ^ March on Washington for Jobs & Freedom. Veterans of the Civil Rights Movement.